This book was written by someone who has tread the same uncharted waters of loss you now find yourself swimming. At four and a half years into my grief journey, I subconsciously decided I didn’t want to be sad, or emotionally held hostage anymore. One day I said to myself, “I don’t want to do this anymore. I am done with it.” I didn’t want the unexpected days where something sad and depressing pulled at me. I didn’t want to be an unknown quantity in my own life. I wished to be done with the grief so I could create a life of my own choosing. After making this subconscious and conscious decision, I discovered Greene’s Release. My goal was to be healed heart, mind and spirit — and healing came about with each release. The heaviness of grief has left and the painful sadness lifted. My life is my own creation, evolving each day into something new. We set ourselves on paths of our own choosing, and now I have set myself on a path – where I can show others there is a different way to get through grief other than trying to wait it out with time. Your entire being has suffered a shock. 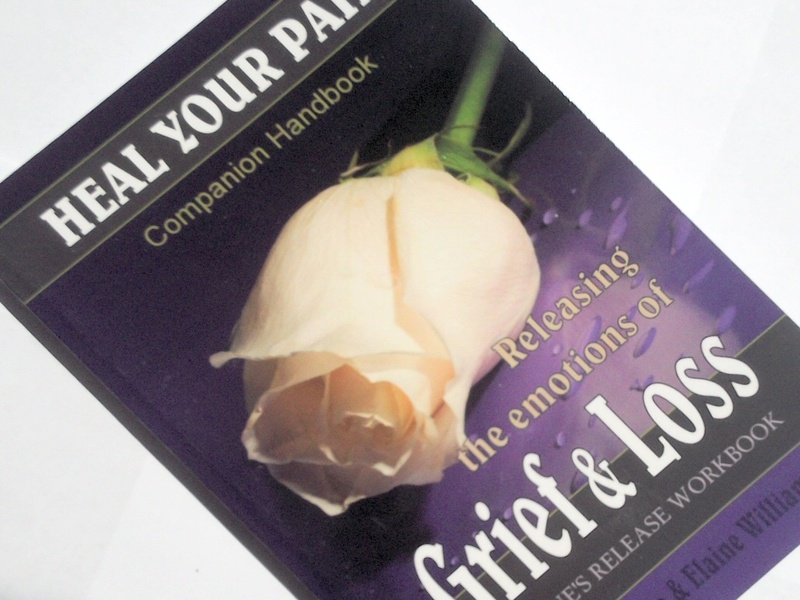 This chapter presents a simple, yet effective plan that guides you through the steps to heal and recover from the pain of your loss. Greene’s Release Mourning gives you permission to grieve, and take it easy on you while you move step-by-step, at your own pace, through specific stages of healing. For those whose grief is fresh, this chapter will be your companion to help you experience and heal each stage fully. For those whose loss happened years or even decades ago, this chapter will direct you to and through your missed steps of healing. For example: Releasing the lingering initial emotions. I want you to go to the store and purchase the loveliest notepaper that you can find and some stamps. Now make yourself a nice cup of tea or hot chocolate, perhaps to have with a chocolate cookie, and write a letter either on the computer or a notebook. This will be what you copy onto the notepaper. I want you to write a letter that is appropriate for your friends and family members who care about you. Tell them that you appreciate and thank them for their care, but you feel the need to take time out for yourself for a while – just for you. Tell them that you are, and will be okay, but need to separate for a while so you can process your loss, and hope they can understand. Explain that it is normal to be quiet, not feel sociable or talk normally (add your own behaviors), but you want to explain this to them so they will understand and not be offended or worried. Assure them that they will be the first to know when you are ready to come out of your cocoon….. The grieving mind is neither calm nor rational, which is a natural consequence of the shock it has encountered. We do not want to use a band-aid to avoid your mind’s natural reactions, but instead we need to permanently change how your mind is acting and reacting. This chapter is written in detail so you can just follow along step-by-step without the need to think. Unresolved emotions are just like any other life situation where things are left hanging. Unfinished. Like a child with building blocks, the pain just keeps being added one upon the other, until it can grow so overwhelming you can’t seem to function or find joy in any aspect of your life. The intensity, frequency and sheer number of Emotional Shocks that you have experienced since the loss of your loved one is overwhelming. You may experience repeated Emotional Shocks from one incident; during the lead up to it — during it — and then again afterwards. The trick is to realize that what you are feeling is an automatic emotional shock in response to a traumatic experience, and that you will be releasing it, so you will not have to keep feeling the ramifications of this event once it is finished. Example: You have decided that it is time to go through your loved one’s personal effects. The mere thought of doing so triggers an emotional shock (anxiety, tension, stress, tears). Then each time this task is thought about prior to actually undertaking it, triggers an additional emotional shock, which is compounded with the previous one. The emotions you feel during repeat Emotional Shocks are therefore intensified because they include the emotions from all of the Emotional Shocks you have experienced about this particular event……. This section is about renewal after the tremendous physical, mental and emotional stress your entire being has endured. You will reawaken your ability to feel alive again, learning how to enjoy the sensations of life. You will remind every aspect of your being how to calm and relax, and come back into their natural state of balance. You will reconnect with your natural life force energy and smile as you feel its revitalizing power surge through you. You will take back control of how you are feeling each and every day, knowing that you are the one who decides. You will share the gift of special surprises with yourself, to experience and feel every day. You will smile as you feel inspired.